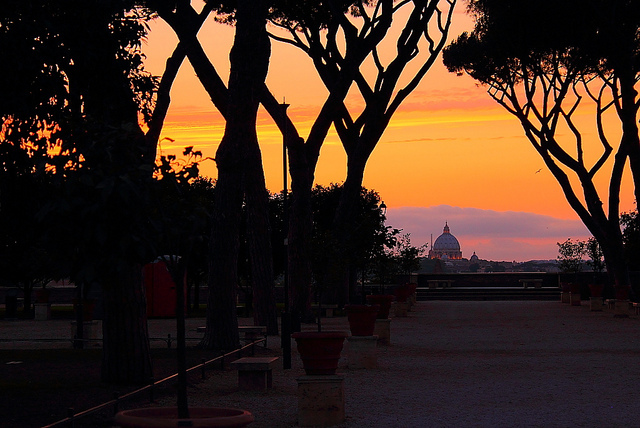 Are you ready to start your visit to the Eternal City? If you have only one day available for Rome I suggest everything goes absolutely seen. The exploration begins from the central piazza Venezia, from where we walk to via dei Fori Imperiali (or optionally you can take a bus) to get to the Colosseum or Flavian Amphitheater. From here you can reach the Circo Massimo, the esplanade that separates the Palatine and Aventine hills. Going on the latter date a peek into the lock of the Priory of Villa portal, in piazza dei Cavalieri di Malta, and then enter the nearby Orange Garden: from there the view is breathtaking! The Aventine hill you can reach the Isola Tiberina. At this point it is best to rest for a while and since it will be done the time of the ideal lunch stop at one of the many characteristic taverns of Trastevere, to taste the typical Roman cuisine. Refreshed and invigorated resume the walk along via della Lungara to reach St. Peter's Basilica. The day can continue with the external view of Castel Sant'Angelo, in front of which is the oldest bridge in Rome that you can take to reach piazza Navona. The next step may be the near Pantheon where you can arriveto the Trevi Fountain, crossing via del Corso. Just enough time to take some pictures and throw a coin to express a desire, as tradition, that already it is time to get back on path towards via del Tritone to reach another symbol of the city: piazza di Spagna. From here you can climb up the impressive staircase of Trinita dei Monti and reach the nearby Pincio terrace to enjoy the view of the piazza del Popolo and to admire the charm of Rome, perhaps at sunset. This is just a taste but if you already know these beauties there'll discover the other, no less fascinating. Share the post "ROME IN ONE DAY"